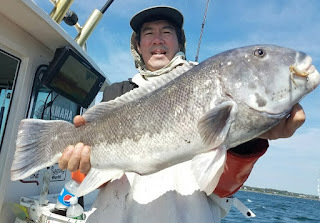 Vicktor Tang of New York had a big day tautog fishing last fall aboard Flippin Out Charters with Capt. B.J. Silvia. He hooked this 11.5 pound tautog when fishing in Narragansett Bay. 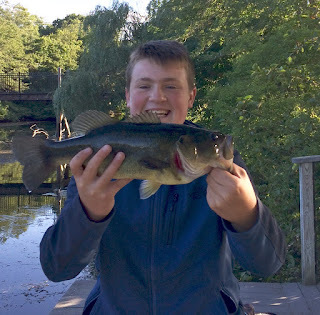 Jack Leyden of North Kingstown (shown in photo) and Steve Sears of Seekonk boated multiple cod and black sea bass when fishing Cox’s Ledge last week. 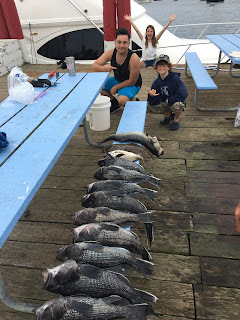 The cod and black sea bass bite has been great there. 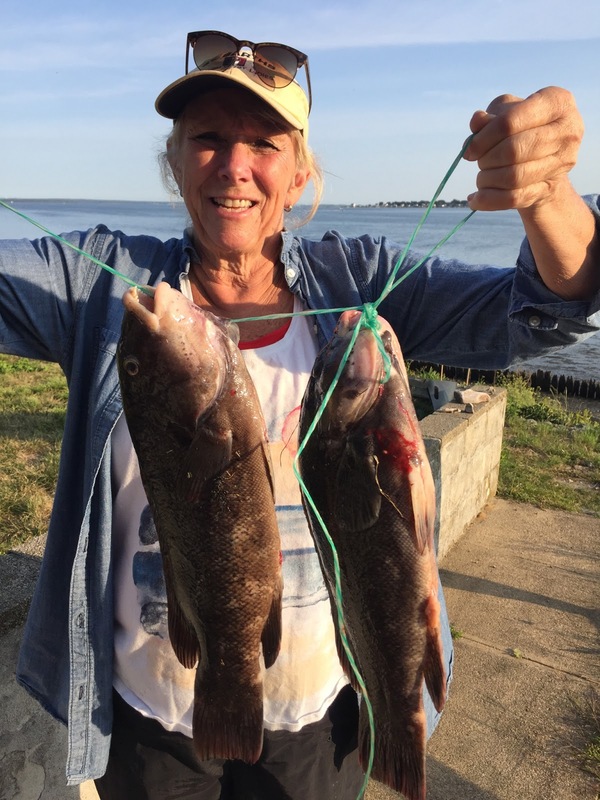 Tautog fishing is much like a tug of war. Once you hook one the battle is on to keep it from going into structure. 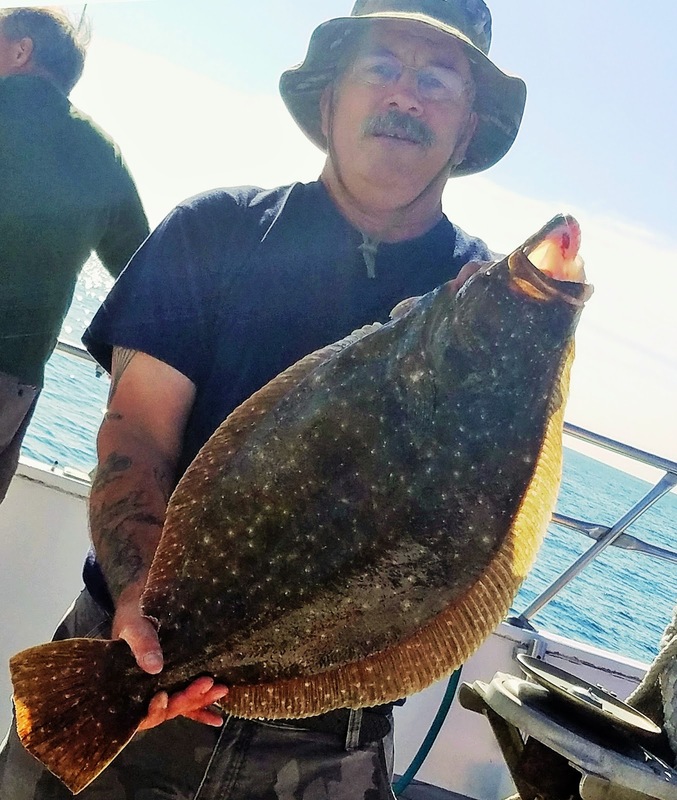 Many times anglers hook up on the bottom when fishing for tautog. My experience is half the time the bottom hook up is caused by a fish that takes the angler’s bait into the rocks before they even know it. 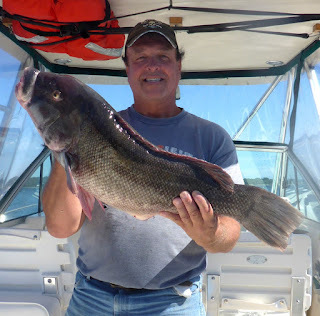 Tautog (or Blackfish) is a great eating fish with a white delicate meat. That’s why anglers love to catch them. 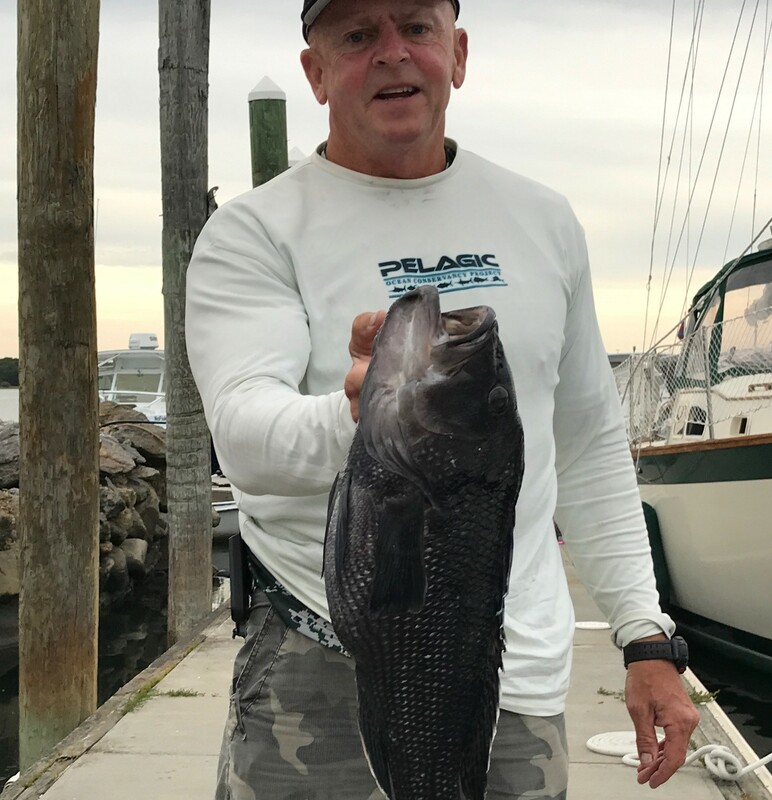 The Rhode Island Department of Environmental Management (DEM) regulates recreational tautog fishing. The catch limit in RI until October 14 is three fish/person/day, then it jumps to six fish/person/day on October 15 through December 15. In addition there is a ten fish boat maximum per day limit (which does not apply to party and charter boats). So, get ready, here are five tips to help you have a great fall tautog fishing season. 1. 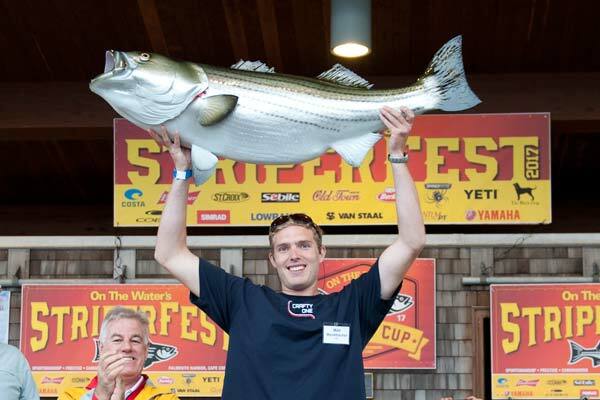 Find structure to find tautog. 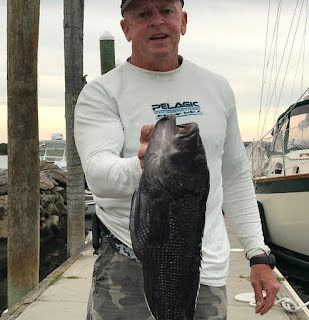 Tautog can be fished from shore or boat and in both cases they like structure (rocks, wrecks, bridge piers, dock pilings, mussel beds, holes and humps along the coast and in the Bay). So no structure, no tautog. 2. Fish where the fish are. This is particularly true with tautog because they are a territorial species, you have to find the tautog, they are not going to find you. So if you get no bites move to another spot. When you find them, you find them and the bite is on. 3. Boat placement is important. 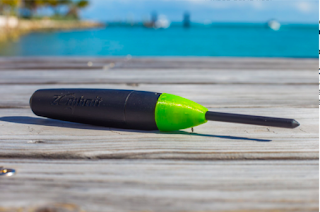 Find structure, estimate wind/drift direction and anchor up current from where you want to fish and drift back to the spot as the anchor is setting. Once in position fish all sides of the boat casting a bit to cover as much area as you can. 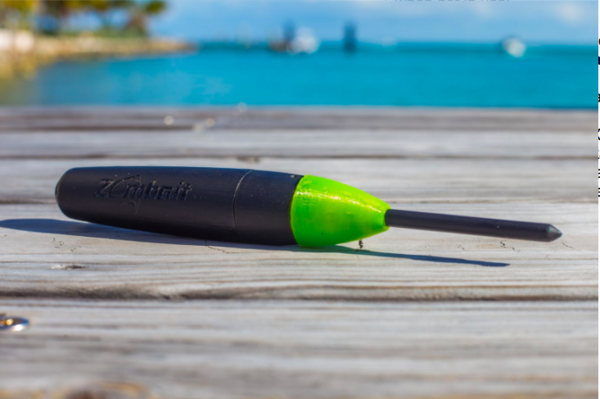 If still no bites let some anchor line out (a couple of times) to change your position, if still no bites it is time to move the vessel. 4. Feel the bite… tap, tap and then get ready for a tug of war. I believe with the first tap the tautog is positioning the bait for consumption. So get ready to set the hook anticipating the second tap before the fish takes your bait into structure. Once the fish is hooked, keep the rod up and pressure on so the fish in not able to run for cover. 5. Where to fish for Tautog. From shore look for rocky coastline like Beavertail Point on Jamestown, locations off Newport and off breakwater rock walls along the southern coastal shore. From a boat I have had good luck at Plum Point light house next to the Jamestown Bridge, the rock jetty at Coddington Cove in Portsmouth, off Hope Island, General Rock in North Kingstown, around Brenton Reef and Seal Ledge off Newport, off Narragansett at rock clusters or the bolder field off Scarborough, Whale Rock, Ohio Ledge in the East Passage and any other place there is structure, debris, rock clusters, wrecks, etc. It’s good to find your own spots as popular ones often get overfished. 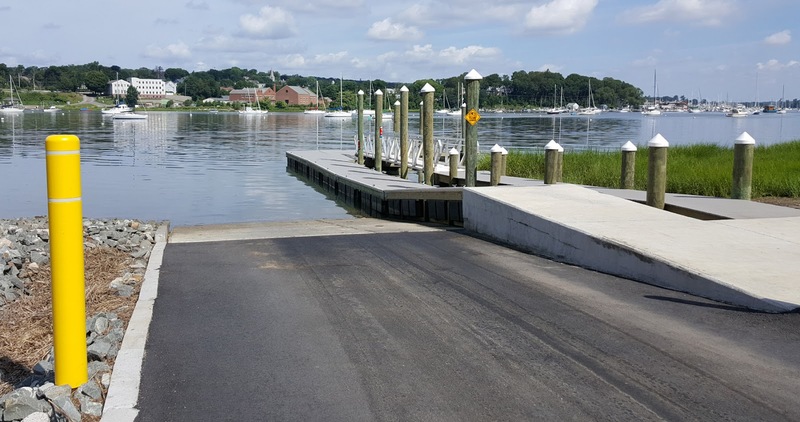 The Rhode Island Department of Environmental Management (DEM) will hold an informational meeting to review Rhode Island’s new monitoring and contingency response plan for harmful algae blooms (HAB). 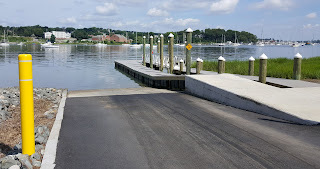 The meeting will take place Tuesday, September 12, 5:00 p.m. in the Hazard Room, URI Coastal Institute Building on South Ferry Road, Narragansett. Last year, Rhode Island experienced its first HAB caused by the presence of toxic phytoplankton in local waters; the event triggered an emergency closure of the state’s shellfishing areas. A subsequent bloom earlier this year resulted in a second emergency closure of some waters. As part of the workshop, officials will review routine monitoring efforts for phytoplankton in the state’s waters as well as new emergency protocols in the case a HAB is detected. Along with its partners, DEM successfully managed the earlier HAB events, ensuring all local shellfish products on the market remained safe. During the emergency closures, partners worked swiftly to collect and test over 190 water and shellfish samples for harmful algae and domoic acid, a toxin responsible for amnesic shellfish poisoning in humans. 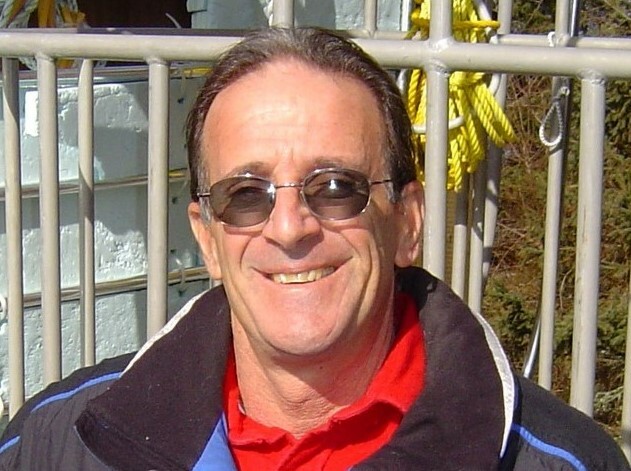 Waters were reopened when all samples tested below levels of concern. In the wake of these events, DEM worked with its partners to update the state’s Harmful Algae Bloom and Shellfish Biotoxin Monitoring and Contingency Plan, which will be reviewed during next month’s workshop. 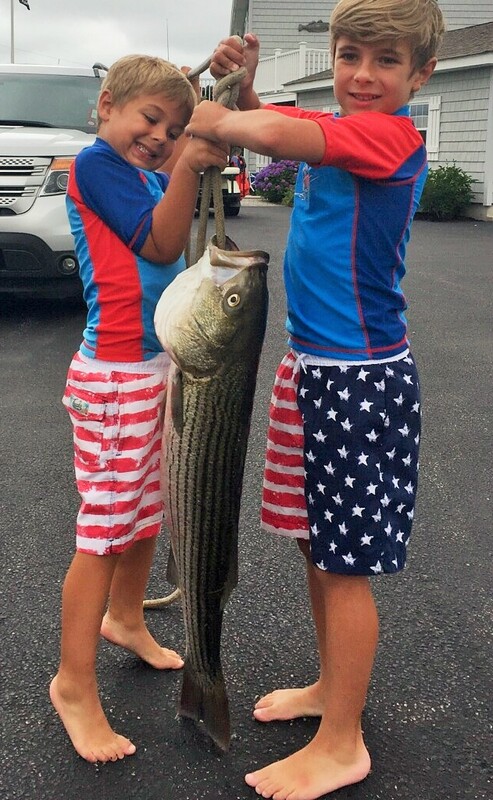 Striped bass and bluefish. “The striped bass bite is excellent for boats but has slowed a bit from shore. It’s spotty. Last night (Sunday) shore fishermen did well with bass from the breachway using plugs and eels.” said Mike Cardinal of Misquamicut Bait & Tackle, Westerly. Spoke with Capt. 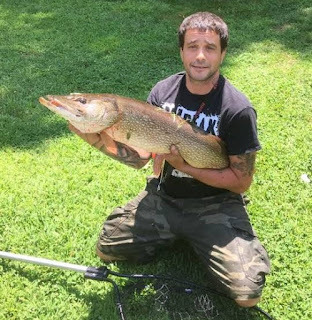 Randy Bagwell of Rebel Charters when at Lucky Bait in Warren. Capt. 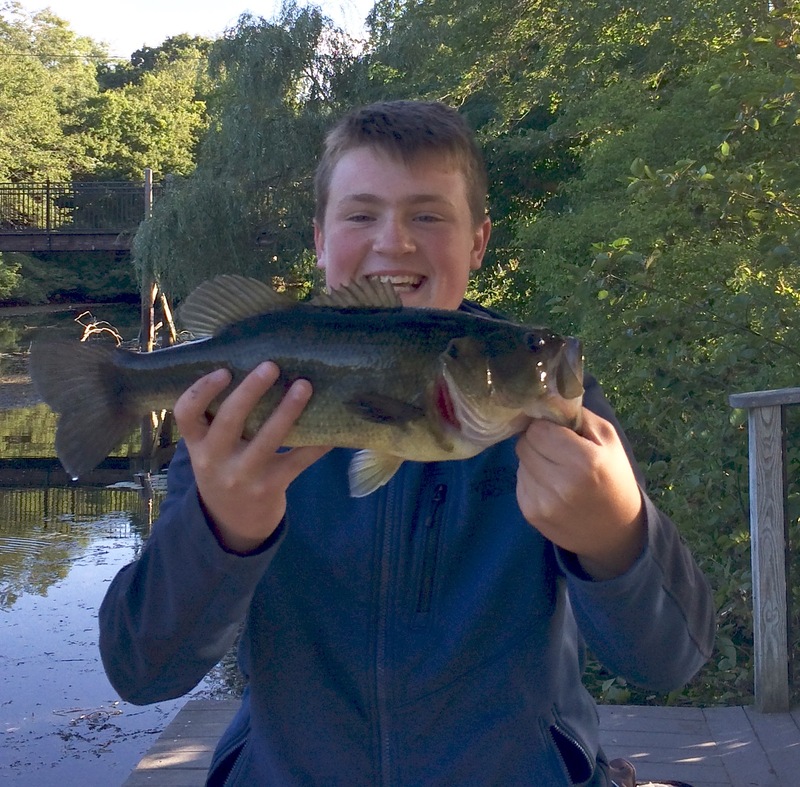 Bagwell said, “Block Island has been hit or miss for bass. 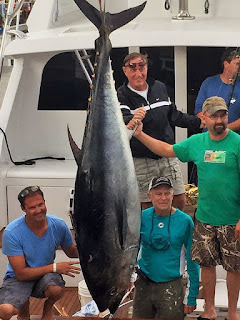 We were out there last week and did not hook up but were going to give it another try today (Monday) but cancelled the trip due to high seas. 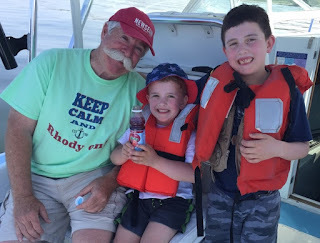 There seemed to be bluefish out there but did not see anyone hooking up with striped bass. 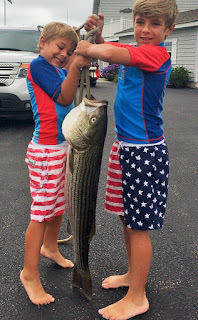 Some nice bass have been caught off Newport with Capt. 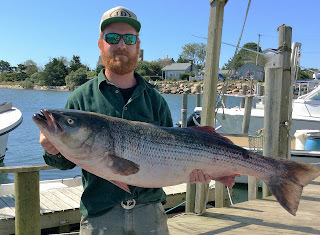 BJ Silvia of Flippin Out Charters landing some nice fish off Newport this week.” The bluefish bite from the Sakonnet River to Pt. Judith has been very good this past week with bluefish often surfacing in schools trapping bait on the surface in a feeding frenzy. 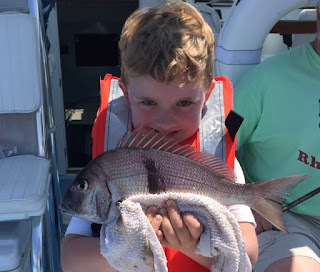 Scup fishing is good. 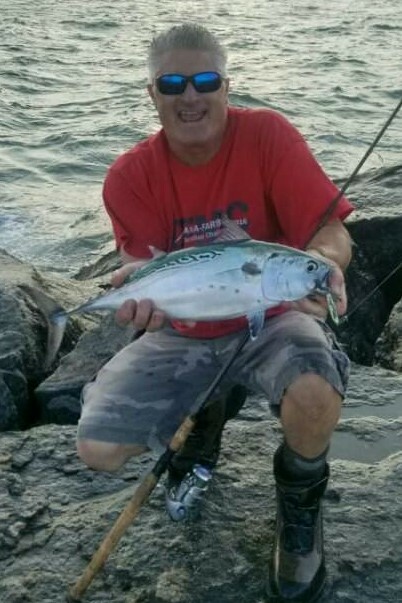 Mike Cardinal of Misquamicut Bait & tackle said, “Anglers are doing well with porgies from the Quonnie Breachway. I fished for scup twice last week with 4, 7 and 9 year old children on board and they all did well with scup to 15” in lower Narragansett Bay along the western side of Jamestown. Cod fishing at Cox’s Ledge was good last week anglers finding the cod are boating fish to twenty pounds and are having not trouble reaching their seven fish limit of black sea bass.